I took off 99% of the index shorts I put on late yesterday [May 20, 2009: Bookkeeping - Cutting Greenhill & Co (GHL) and Adding to Short Exposure] - these helped us weather the selloff today in flattish condition. If you really follow the market closely you can see a lot of shenanigans happening in the last 30 minutes of the day ... I can't ever recall a time seeing the S&P jump in 3-4 point increments so often as I have for the past 6 months. Where these huge surges come from is beyond me (ok, it's not beyond me, I have my suspicions but let me come down from the grassy knoll) Last fall it used to be the last hour, now its the last 30 minutes. 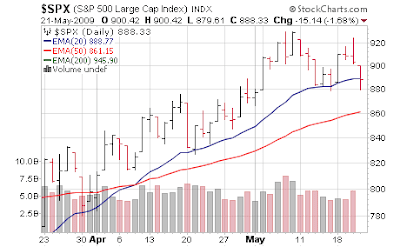 I said earlier the 20 day moving average was key, we had not been below it since March 12th - this was S&P 885, 886. We were below it around 3:30 PM - testing S&P 880 and lo and behold the Plunge Protection Team via Goldman Sachs... err, I'm sorry "short covering".... took us back over into the bell. [Jul 14, 2008: Our Gospel is Spreading - Jim Cramer References "The Hand"] [Jan 9, 2008: An Amazing Blunt Commentary on the Plunge Protection Team] I knew when I saw the S&P jump from 881 to 885 in a span of 30? 45? seconds in the last 30 minutes it was time to head for the exits on the dark side of the ledger. I'm learning to adjust to these (ahem) free markets... 80% of the days since early march futures will go up between 7 AM and 9:29 AM (I guess there is not enough time to buy stocks during the day). And the last 30 minutes are ... well let's just say some unnatural movements occur there. 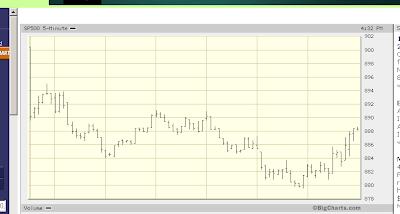 Notice the magic on the 5 minute intraday chart - just before 3:30 PM...all day not one huge upmove then boom! - from danger to in the clear just like that. 10 minutes later ...another. And another. No buyers all day then suddenly such immense demand to buy stock with 30 minutes to go. Boo and Yah.